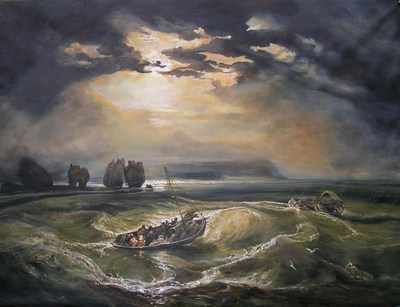 HIGH PRESTIGE EXHIBITION STANDARD VERY LARGE (TRUE TO ORIGINAL SIZE) REPRODUCTION OIL PAINTING OF TURNER'S "Fisherman at Sea" (The Cholmeley sea piece 1796) ....BY THE FABULOUS ARTIST DAVID ALDUS. This lovely large reproduction painting, painted true to Turner's original size, uses oils ever more transparently and turned to an evocation of almost pure light by use of shimmering colour!!.. Measurements 3 foot x 4 foot.